West Ham's Glenn Roeder has won the Barclaycard manager of the month award for March following an unbeaten month in the Premiership. The Hammers boosted their chances of avoiding relegation to Division One with wins over Tottenham (2-0), Sunderland (2-0) and a draw against Everton (0-0). Roeder picked up his first ever manager of the month award, narrowly ahead of Manchester United boss Sir Alex Ferguson and Liverpool chief Gerard Houllier. 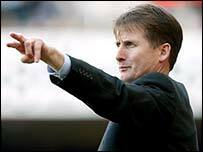 Nic Gault of the Awards Panel said: "These awards are often given out to those at the top of the league so it's especially nice to be able to recognise Glenn Roeder who has done a terrific job of turning around the fortunes West Ham. "They have gone four games unbeaten and only conceded two goals in their last five. "His coaching ability and determination have served him well this season and there can be little doubt, he will be doing all he can to guarantee the Hammers Premiership survival." The last West Ham manager to receive the accolade was Harry Redknapp for in November 1998/99.